No matter how amazing acoustic violins are, electric violins might be of interest to some violinists. There are several advantages to electric violins as well as some circumstances where an electric violin may be the optimal tool for a musician. Today we are going to focus on this particular type of violin and show you some candidates for the best electric violin out there. Lets get started with a brief overview of the subject and then we’ll get into electric violin reviews and silent violin reviews. An electric violin is a violin that can produce sound electronically. 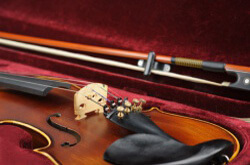 The electronic or digital signals generated by electric violins can generally produce brighter, louder sounds than its acoustic counterparts. Aside from that, the sound of an electric violin can be tweaked and enhanced. With their plug-and-play capability, this kind of violin is a good choice for a violinist who wants to play with amplified bands. 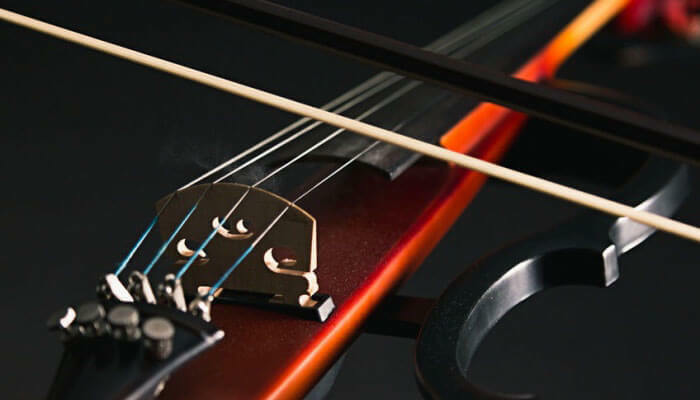 Whether you are a student looking for a new electric violin, or a musician searching for a good quality electric fiddle for gigs, it is important to recognize that the selection of an electric violin can be quite as challenging as choosing an acoustic/traditional violin. We are all wondering what is the best electric violin to buy? How much does an electric violin cost? What is the best electric violin for beginners? There are lots of factors to consider when looking for the best electric violin. Here’s a buyer’s guide to finding a suitable electric violin to match your needs. Some aspects of an electric violin are permanent – what it is made of, its shape, and its specific style. These characteristics give it its quality. However, there are other considerations that should be kept in mind, such as violin’s playability, sound, and overall quality. Once you know all of these parameters, you should do a electric violin comparison in order to narrow down your search. With that in mind, lets start with the basics. Electric violins come in different shapes and form. Before heading out to the nearest music store, try browsing online and familiarize yourself with common electric violin styles. Are you after cool shiny models that looking radical and will make people ask, “What is that instrument?” Or are you someone who wants a simpler package? Our tip is to go with what best suits your taste! 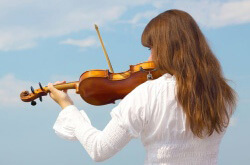 There are different violin tones: darker, brighter, or somewhat neutral. Although tone is believed to be very much subjective, there are some electric violins that are more “natural/ acoustic sounding” than others. Also, equalization and effects are an option, which may help you get the tone that you want. For greatest satisfaction, we suggest that you have a baseline tone that pleases you as the player. Usually, as the electric violin’s price goes higher, its tone becomes more advanced, and more natural sounding. Traditional violins are sold with different names. This is not just a way to have a nice nomenclature set for violins but rather a grouping technique. Electric violins, on the other hand, have different ‘groups’ too. Now, let’s examine each group one by one. Electric violins can be really loud. If you are starting on this fun adventure of electric violin playing and still feel that you are making noise, don’t worry, you will master the technique with due practice and diligence. However, be prepared to hear from a complaining neighbour or a distracted family member in your house. Likewise, you can get the best silent violin for practice. Don’t worry, it’s not actually silent. Silent violins are violins that have headphone jacks that can be used for silent practice. When you find the best silent violin and put it in your hand, you will never have to worry about disturbing anyone while practising day in and day out! 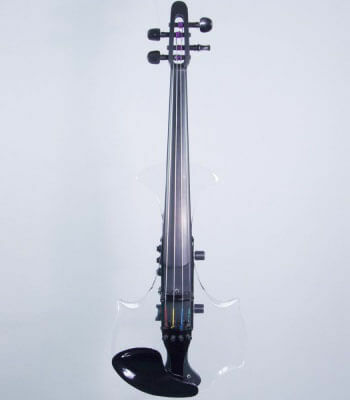 An acoustic-electric violin, as the name implies, is a violin that makes sound acoustically, and at the same time, can be electronically amplified. This is made possible with the use of ‘pick-ups’. Pick-Ups are small devices that essentially ‘converter’ a physical vibrations into an electric signal. Acoustic-electric violins look acoustic but work like an electric violin. If you think that you might perform in a venue that features good acoustics and doesn’t take kindly to tricked out modern electric violins, you will probably want to get an acoustic-electric violin. After all, most acoustic electric violin reviews tell that story quite well. Frets – these are the strips that are found on the fingerboard. Just like guitars, some awesome electric violins have frets. Why? One of its purposes is to enable the violinist to incorporate guitar techniques and simplify chord shapes. Aside from that, frets can provide a visual guide, which can be very useful to those who are playing in a loud environment. So, if you are playing with a loud band and you find it difficult to monitor your pitch, it might be best for you to get a fretted violin in order for you to be able to play perfectly in tune. If you are looking for the best electric violins intended for professional level of performance or serious recording projects, and you want to have a sophisticated high-tech looking violin, pure electric models might be best for you. Without the traditional-classic violin body look, these violins have a body shape that is a slightly modified. Their shapes vary from an S-form to a narrow trapezoid with tuning that is done from the tailpiece. 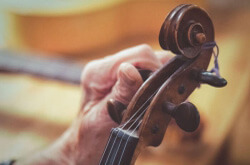 Nevertheless, since they are outfitted with a standard length, adjustable violin fittings, this type of violins can still be played like a traditional violin. Looking at the cost, durability, and sound quality, we’ve gathered and listed some of the best electric violin brands. You have probably heard about a Kinglos electric violin or a Merano electric violin, but what do these names mean exactly? Our goal was to to help you out in your search for the best electric violin for beginners as well as the best rated electric violin overall. Here are the top 20 electric violin reviews for 2019. 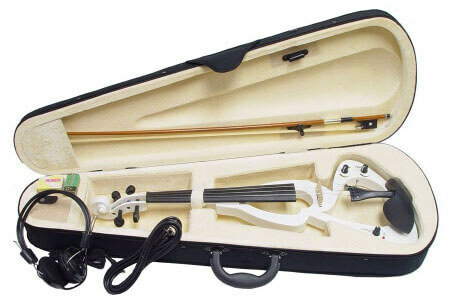 Crescent is another good electric violin brand for students who are just starting out and need an affordable solution. They probably make the best budget electric violin you can find. These violins are suitable for kids and beginners. Indeed, this brand is a great starter violin for those who are showing an interest in learning to play an electric violin. Truly, Crescent is one of the best beginner electric violins! It’s a best value electric violin in its category. If you are someone who just wants to try an electric violin, or you need something to muck around on, the Crescent EV is a great option. If you buy this electric violin on a whim and never get the chance to play, you will not lose sleep over the money you have invested in it. Well, it’s the best cheap electric violin available! ViolinSmart Electric violins offer a reasonable quality instrument for those on a budget, and are primarily aimed at the beginners and students alike. 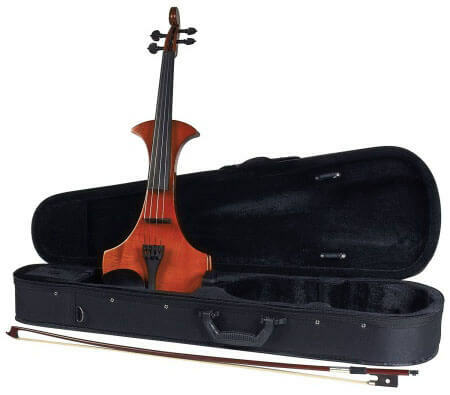 ViolinSmart electric violins may not be as durable as some other electric violins, but it will certainly suit the needs of a beginner violinist and is a solid choice for those wanting to get to grips with an electric violin before splashing out on a expensive ones. The High-grade 8 Pattern Electroacoustic Violin is a good pick for those who are new to the violin world. As its name indicates, the design features an 8-figure pattern made of good quality woods. This outfit is budget friendly and is perfect for those who don’t want to spend much. It is also great for beginners who are not too sure about their commitment to playing the violin. If you are willing to shell out a bit more money you can get a good electric violin by Merano. 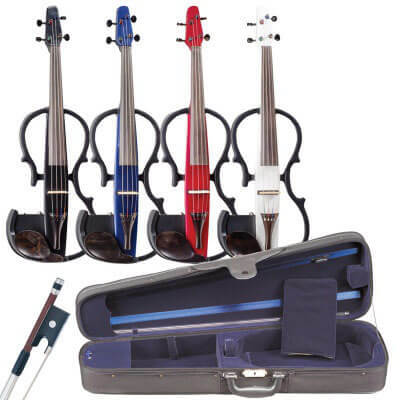 Though they have models of all colors that look more like toys than serious classical instruments, their upper range products are great for beginner as well as intermediate electric violin models. Established in the year 2000, Merano has made a splash on the instrument market by making best rated electric violins. It comes in a variety of colours. If you buy Merano, you can be confident that you are getting an instrument worth the amount you pay. Their company policy is that they would never sell something under their brand that they would not play themselves. Indeed, their violins are one of the best inexpensive electric violins on the market! Cecilio made it in our list of best beginner electric violin brands, as they are one of the best violin manufacturers for both traditional and electric violins at the moment. Cecilio electric violin tends to win affection from violinist of all levels, with their high quality instruments. Cecilio is named after the patron saint of music and musicians, St. Cecillia. This awesome electric violin is cherished. Because with Cecilio instruments, experienced violinists can certainly make heavenly music with their violins. This set comes with everything that you will need for your musical journey with an affordable chance to get your hands on serious bit of kit. Although relatively new brand for electric violins on the market, they offer electric and acoustic violins of all sizes, shapes, and colors to suit all budgets and tastes. Their violins bring lots of features which you can have without destroying your bank account. Unfortunately, you get what you pay for with this instrument. It does not come with a body made from a high quality solid wood. They are instead made out of a plywood. This means that it is not as tough as other non-plywood electric violins. Kinglos, who also manufacture beautiful classic violins and acoustic guitars, were founded in 2009 in Shanghai. The makers are skilled designers and developers of musical instruments that combine traditional instrument construction with visual arts. Comes with an impressive pick-up system that consists of a DV-9 active pick-up, with volume and tone controls. Larger price tag than other electric violins on the list but certainly the best electric violin for making a statement while you show offyour original piece! If you are looking for a fun, pretty violin or party violin, the Kinglos electric violins are certainly great. With its unique design, everyone will know that you are really into music and arts! Don’t expect that you’ll be welcome at orchestra with such a flashy instrument though! If we are talking about violins, Stagg is sure to be on the list. They are often suggested by electric violinists and violin instructors as one of the best electric violin brand names you can trust. 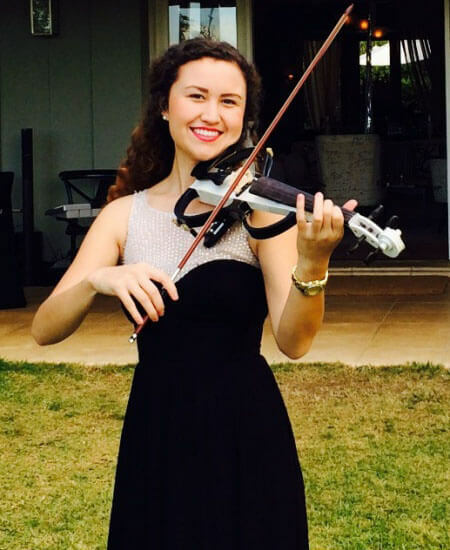 If you want to transition from a beginner to an advanced violinist, you should check this model out! Stagg EVN 4/4 Silent Violin is one of the best intermediate silent electric violins. Cremona is an award-winning company that was founded in 1989, and is renowned for making high quality violins. This electric violin is simply elegant. It’s a violin with the perfection and quality for all violinists of all skill levels. Also, this outfit is a very affordable option for novices or those who want to attempt learning how to play electric violin. 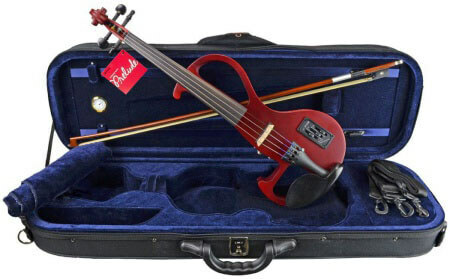 The Fender FV-1 electric violin is one of the most sought after electric violins. 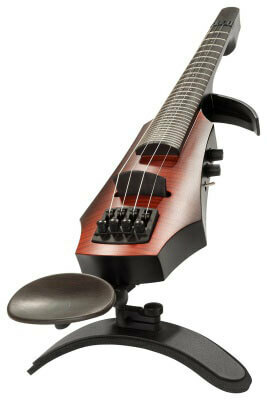 It is also among the best intermediate electric violin models out there. This model is made like an acoustic violin with spruce top that has long been held to resonate best. This is an excellent choice for the advanced to intermediate musicians who is looking for an instrument that makes a statement. 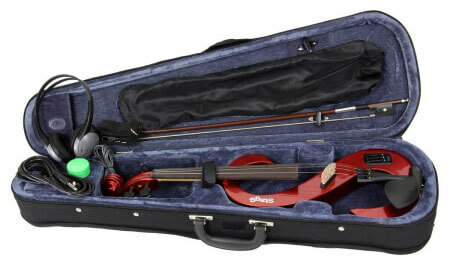 It is the best acoustic electric violin at this price. Considering all of the accessories and freebies that you get with this outfit, the price tag attached to it is just worth it. The makers of this violin have eliminated the need for fine tuners with new and improved pegs, making the strings resonate more and the instrument sound louder. Sold exclusively through Shar Music, this electric violin is indeed one of the best acoustic electric violins, which can be bought for a reasonable price. With a Plug ‘n Play electric violin, you will certainly be able to express yourself in its futuristic yet good quality design. Barcus Berry instruments are known for their positive reputation in providing quality reliable instruments. Their stylish acoustic-electric violins are handmade in Romania. If you are serious about electric violin playing, or you want a flashy, radical looking, acoustic-electric for gigs, the Barcus Berry Vibrato-AE is worth your investment and will look very suitable on stage. 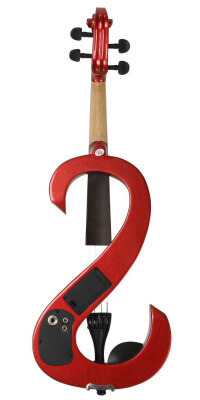 No doubt, this electric violin is a great choice for a budding electric violinist. Another top rated electric violin is the Phoenix Performer, which produces a quality sound that is worthy of its higher price tag. Amateurs and experts vouch for the quality whenever they play the Phoenix Performer Electric Violin. This electric violin is a reliable instrument with an enhanced capability combined with additional features. If you look after your instrument well enough, this durable violin will last for years. There is no doubt that this is the best electric violin for the money at the moment. DZ Strad is a well-known name in the violin world. They have a strong reputation for providing well-made instruments and they do not disappoint with this model. This is an intermediate electric violin to professional grade instrument that can help you go through your musical journey. So, if you have extra money in your pocket, this may be the best option for you. Although it’s not too expensive, it is sure more expensive than other entry level models. The Stingray SV electric violins are top notch violin brands that were made famous by the Emmy-winning violinist and composer Mark Wood. 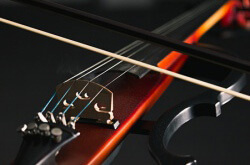 The Stingray SV electric violin is one of the best electric violin on the market. It can take you to the next level of rocking out your audience’s world without breaking the bank. 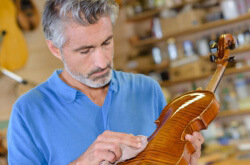 As a maker of all sorts of musical instruments and one of the best contemporary violin makers, Yamaha Corporation has become a household name for a good reason. If you are looking for a beginner violin that can be used for modern, new wave music, this might be the coolest option from the list. This violin is a solid performer for any novice to pretty advanced students. While it may not be the best Yamaha electric violin on the market, it is one of the leaders in its segment. With this Yamaha Electric Violin, you can rock out for decades! Aurora Electric Violin is one of the few brands that give you the chance to customize your violin. Features include thee ability to boost the bass or treble with the use of the tone knob. The Aurora Electric Violin is an excellent value for money and will not leave you feeling that you have wasted your money. 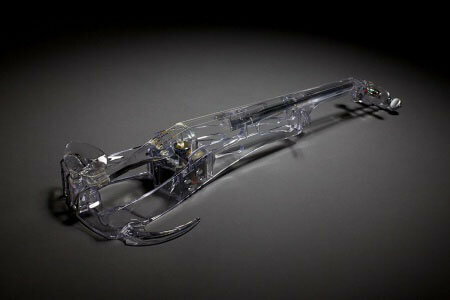 Ted Brewer Vivo Air is the next level futuristic violin that has been created. Why? Because it is one of a kind. Take a good look and realize that it is a very nice looking transparent violin. The Vivo Air is an interesting novelty violin, but if you have that much money in your pocket to buy an electric violin, you’d be better off checking out other pricey electric violin models on this list. The NS Design is for serious electric violinists, given the fact that it comes with a heavy price tag. Yes, we included this violin on this list. After all, we are talking about the best electric violin choices, and here we are giving you a chance to take a peek at what top tier electric violins look like. It may not be the most expensive electric violin, but it is sure up there in price. If you are thinking of being serious about playing an electric violin, and you aren’t scared off by the hefty price tag, we highly recommend the NS Design NXT Electric violin to you! It is a professional electric violin by all means. Choose the right electric violin that you are comfortable with. That stands true even if you are limited to a good cheap electric violin. The secret is that you must be willing to carefully find an instrument that compliments your playing style. The majority of the electric violins featured on this article are reasonably priced and come from some of the best brands available in the market. Playing an electric violin is fun. It allows you to practice in peace without disturbing anyone in your vicinity. Taking your time and being patient to select the right electric violin will pay off in the long run. So, be sure to keep these tips and list in mind while choosing and rock on afterwards!